Former Egyptian army chief wants "unprecedented numbers" in upcoming vote. 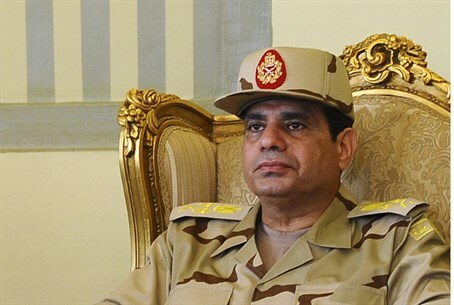 Former Egyptian army chief Abdel Fattah al-Sisi on Sunday called for a big turnout in next month’s presidential election, according to Reuters. Sisi, who deposed the Muslim Brotherhood’s President, Mohammed Morsi, after mass protests against his rule last July, faces only one competitor in the May 26-27 election - leftist Hamdeen Sabahi. Sabahi came third in the 2012 election won by Morsi. Sisi called on Egyptians to vote in "unprecedented numbers for the sake of Egypt," according to an official statement quoted by Reuters and which outlined comments he made during a meeting on Sunday with investors in the tourism industry. An alliance of Islamist parties opposed to the military’s ouster of Morsi earlier issued a statement declaring their boycott of the election, describing it as "a farce" designed to appoint "the coup orchestrator" as president. In a statement posted on Facebook, the National Alliance to Support Legitimacy also said it would not recognize election monitoring planned by "Western supporters of the coup" - an apparent reference to the European Union, which has agreed to send an observation mission. Sisi took the approval of the constitution in a January referendum as a vote of confidence for his presidential bid. In what appeared to be an attempt to discredit Sisi, an Egyptian journalist claimed last week that the presidential candidate is Jewish, and that he grew up next to Israel’s former Chief of Staff and Defense Minister, Moshe Dayan.